You might be surprised at how long a rubber roof can last when properly maintained. This cost-effective roofing system is advertised as low-maintenance, but as it starts to age, timely rubber roof repairs and rubber roof restoration can add several years to its lifespan. The Roof Coating Company has been working on rubber roofs for decades. For a free onsite roof evaluation, give us a call at (757) 244-2305. Rubber roofs are known for being affordable yet durable. These flexible roofs handle changing temperatures and all types of weather quite well. The material is fully recyclable which makes it an eco-friendly roofing system. The Roof Coating Company is made up of a team of qualified roofing technicians that have decades of industry experience. 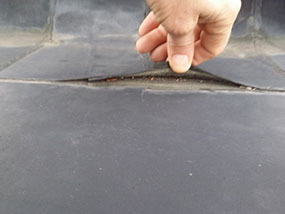 When it comes to rubber roof repairs, the actual repairing is only part of the process. Before a repair can be made, your roof must first be properly diagnosed. Our thorough roof inspections will detect any and all leaks so that by the time we leave the job site your roof will be as good as new. When you suspect that your rubber roof is in need of a repair, the longer you wait the more it will cost you. Water damage spreads quickly and can make repairs a lot more complicated. Regular roof inspections will help keep your roof intact and prevent problems from sneaking up on you. Any loose flashing, separation at the seams, ponding water, or issues with your rubber roof’s membrane should be looked at by a reputable team like the Roof Coating Company. 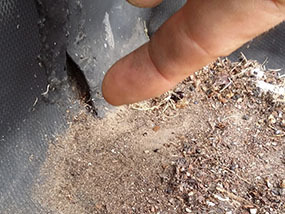 If your rubber roof continues to develop new leaks, it’s clear that something needs to be done. However, many people jump the gun and immediately opt for a roof replacement. The Roof Coating Company can apply a roof coating to your existing rubber roof that will have it watertight for over a decade longer! This service is quick and affordable making it a solid alternative to a roof replacement. Clients in Hampton, VA can trust us to provide quality commercial roofing services. Whether it’s a rubber roof repair, restoration, or replacement, The Roof Coating Company has your back. For a free estimate on any of our services, give us a call at (757) 244-2305.